Almost 90 people came to Mass yesterday; numbers continue to grow! Matthew Schellhorn sang and played the organ beautifully. This Sunday is Catechism Day – classes for under 8s, 8-16 year olds and adults will be from 1030. For those who wish to take some home, this year’s Epiphany water will be available at the back of the church today and next Sunday. Please bring your own empty bottles. Our series of First Sunday Catechism continues next Sunday 3rd February starting at 10.30 for the under 8s, 11.00 for the under 16s and 11.30 for the adults. Listen out for the bell which marks the beginning of the session! The Academy is due to open in September 2019. The Friends group is being set up to support the Academy in spiritual and fundraising ways. It will have its own website shortly which will tell you more. After Mass today, we welcome Chris and Lucy Norfolk’s first child, Marc Anthony, who will receive the Sacrament of Holy Baptism. All are welcome to stay for this. Epiphanytide house blessings for the Bedford Latin Mass faithful are being bestowed this weekend. 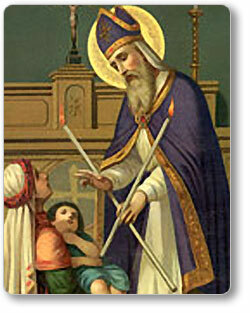 It is possible to have this blessing up to the Feast of the Purification on 2nd February. Please speak to Fr O’Donohue if you would like this. Our Quiz Night with Fish and Chip Supper is on Friday 25th January 2019 at 7.30pm. Tickets are now available at £7.50 per person; please see Barbara. Other options are available for non-fish eaters.